Granted, this is a particularly bold statement given we’re only a couple of weeks into the new year, but I think I might have already necked one of the best dishes that 2019’s going to offer up. What’s more, and hear me out on this, it’s a salad. Still not convinced? Try this: the sheer richness of the thing left me defeated halfway though, and that’s coming from someone who had leftover mackerel pasta for breakfast this morning. 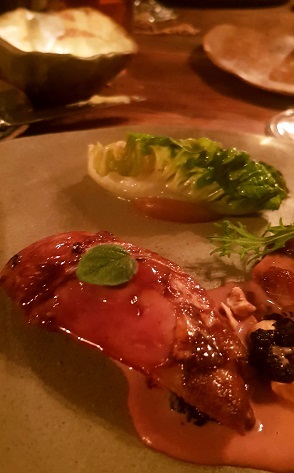 Here’s further evidence, then, (if any more was needed) that the Moorcock Inn has firmly hit its stride and is firing out some of the most interesting and satisfying scran not just around these parts but, I’d posit, further afield too. It’s not that long since I last blathered on about this place so let’s keep this quick. The top-notch bread is still swarthy and rugged and still comes with a mountain of creamy butter. There’s still a “digestive tea” (rhubarb and mint on this occasion) that everyone else seems to enjoy more than I do. And there’s still superlative ice-cream to be had – thick and luscious – that me calling “artichoke-flavoured Vienetta” does no justice to whatsoever. Beyond the ever-presents we mainline snacks of spikily-spiced Brussels sprouts, arguing – possibly a first for the infamous brassica – over who gets the last one. We down a porridge of barley and kale which, written down, reads a tad Deliciously Ella but on the plate – vibrant and vivid – has nothing of the puritan about it. I’m not sure where or what the ‘yeast’ element is but we’ve had it here before and it adds a pleasing packet-of-crisps note wherever it pops up. 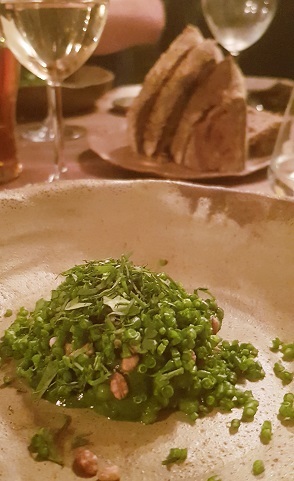 There’s a steaming parcel containing tender chunks of coley – it’s accompanying deeply savoury shellfish sauce particularly good when dredged with that bread – and there’s a slab of woodlandy partridge on a parfait-sauce hybrid (made from the bird’s offal? Think so…) with a wodge of crunchy seared lettuce that delivers more (smoke, bite) than you might imagine. 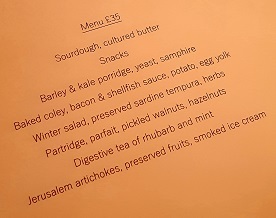 Because they’re nice, and because they prefer to showcase the humble ingredient over the luxe, they fling this stuff out for a very generous 35 quid a head. It’s no wonder that in what’s usually a bleak post-Christmas slog the place is bouncing. Here’s a repertoire that throws in pleasant surprises (see opening gambit), the occasional thought-provoking “eh?” (I’m looking at you “toffee apple” of previous visit) but, most of all, highly pleasing and deftly executed scran in a buzzy room with warm & welcoming folk running the show. And if all the above sounds a little too interesting then I suggest you open your minds ease into things by ordering from the blackboard and eating in the pub. They knock out a pearl of a pork pie and pints of Landlord are £3.40.